The LPGA’s first International Crown competition ended less than a week ago and already preparations are well underway for the second staging, in July of 2016 at Rich Harvest Farms in Sugar Grove. 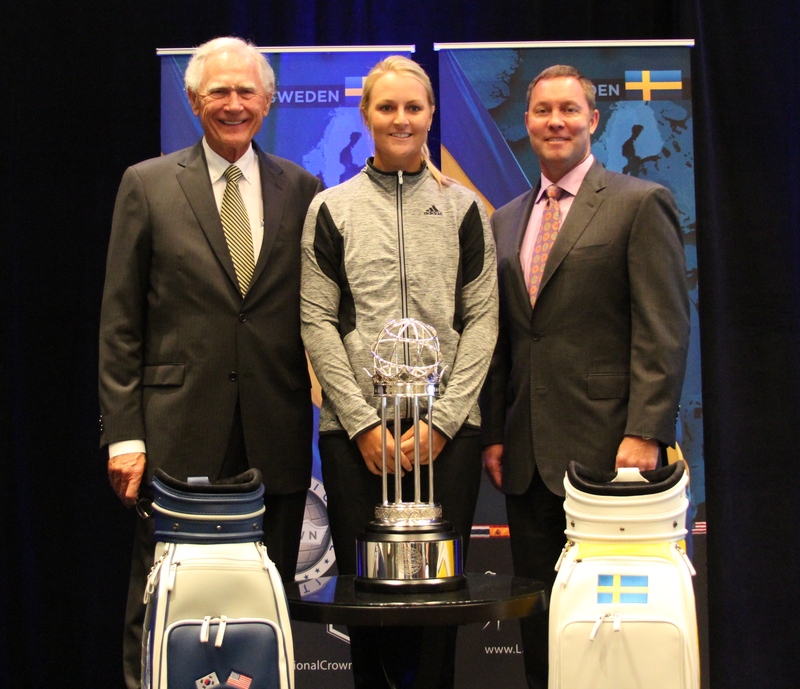 Rich Harvest owner Jerry Rich, LPGA star Anna Nordquist from Sweden and LPGA commissioner Mike Whan (left to right) hosted a Launch Party on Friday at Naperville’s Hotel Arista for the next eight-country, 32-player competition two years down the road. The first version was won by Spain at Caves Valley in Maryland. The Rich Harvest version falls a month before golf’s return to the Olympics in Brazil. The International Crown certainly did at Caves Valley. The top two seeded teams, the U.S. and Korea, met in a do-or-die playoff for the fifth and last spot in the finals, Korea winning. The disappointing showing by Team USA didn’t hurt world-wide viewership. Rich hosted the most successful Solheim Cup, a U.S. win over Europe in 2009. He and Whan started plans for creation of International Crown a few weeks later at Rich Harvest. 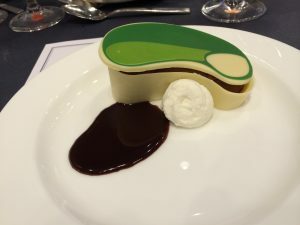 A creative dessert topped off the festivities at the International Crown Launch Party. A big part of that work has been in the recruitment of high school golfers. Rich invited every girls team in Illinois to the 2009 Solheim Cup. For the International Crown he’s invited over 1,800 teams from Illinois and neighboring states. They’ll be housed at Northern Illinois University and Aurora University during the matches. Whan also announced the first two Ambassador Sponsors for 2016, Rolex and Calamos Investments. The first Crown had five corporate sponsors. More will be coming.